Chukka in rich leather and suede uppers. Rubber outsole with texture for extra traction. These shoes are super as they are both dress and casual! Not comfortable, the size is smaller. My only issue with them, is that I wish they were a bit more comfortable. The heel and midfoot areas a tight. They seem to be breaking in some but since not quite there. Great materials used throughout the entire shoe. Good looking shoe, but sizing is much tighter than other Cole Hahn chukka’s I have owned. Size runs small compared to other Cole Hahn Chukkas I have owned. Hopefully, they will stretch so they become comfortable. I like they way they look. Excellent shoe. Looks great, is comfortable and seems really durable. 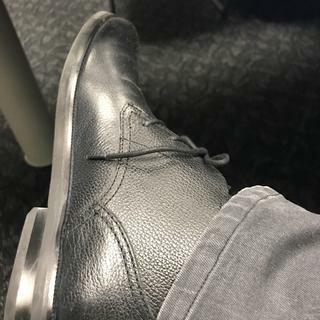 I just bought the most comfortable and incredible elegant shoes from Cole Haan I probably have like ten different pairs definitely I would recommend this shoes to my friends and family. Cheap Fall/Winter boot that I will get alot of use out of it. Need a new short black boot that I can dress up or go casual in. amazing price and I needed a walking shoe for the winter and the summer. I can almost always rely on the sizing of Cole Haan without needing to try them on in the store. I like the design of the shoe. I was looking for a pair of boots. This was a very attractive pair for an amazing price. Good reviews, great price, and I need some nice black boots. Other styles didn't have my size. I need some nice shoes for work that didn't cost too much. I liked it and it was a good sale. My husband needs some comfortable shoe for work. However, I like that they look comfortable and stylish. Quality and very low price. I PURCHASED THEE SHOES BECAUSE THEY HAVE A NICE,CLASSIC BUT CASUAL LOOK AND WILL GO WELL WITH DENIM. a good everyday go-to boot i can wear to work. We Love the confirm of the shoes and price is AWESOME!!!!!!!! I bought a pair in brown suede for my son for Christmas. He loves them.. Husband has a pair of this shoe in tan and loves them. Loves the quality and the fit. I ordered one pair...arrived today....perfect fit and comfort...so another pair on order!!! BEST ANSWER: This chukka is not Goodyear welted. I normally wear 10.5 D pinch penny tassel grand, is the sizing similar? BEST ANSWER: I ordered an 8.5 - Medium in this item and it was definitely running small on the width . I would probably order up a half size larger . I own 4 different pairs of Cole Haan shoes, all in 11D. All I can say is that the sizing has been quite consistent in my experience. I am a rock solid 9.5D. I ordered a 9.5D. It's perfect!